Things have been so busy between work, launching Lassies Who Lunch and getting ready for Halloween that I totally spaced on What I Wore Wednesday last week---oops! I did get a post up about our amazing trip to France, including vlogs from the cutest little vlogger ever--Blondie Boy! I love Halloween and this was the first time in two years we were home in Scotland and not in the USA. This year he decided he wanted to be a dancing robot. So I bought some chrome effect spray paint, diamanté, buttons, sparkly leggings and flexible silver ducting and went to town. We already had some rain boots that a friend had given us as hand-me-downs so those got spray-painted, too. I finished it off with some white hairspray (couldn't find silver) and some loose silver make-up glitter and CR3 The Dancing Robot was born! He also requested robot fingernails so who am I to say no when I own holographic silver polish already :) I think his costume came out really cute and he definitely stood out from the other kids. All of my costumes growing up were home made so I'm glad to carry on the tradition. For work that day I had on cat ears and some drawn on whiskers (only my team dressed up at work and there were no full-on costumes) but I wanted something a bit more fun for trick or treating with Blondie Boy. Normally I try to match my costume to his but after getting him ready I only had ten minutes to sort myself. So I decided to take a risk and made myself a Dia de Los Muertos sugar skull type look. The gems were a bit big and it wasn't as elaborate or colourful as I would have liked but not bad for ten minutes! It kind of makes me want to go to the tanning bed though as I definitely don't suit being super pale. We had a fun time visiting houses but it definitely is not the same as being home in Ohio. I much prefer specified trick or treating times and knowing that if a light is on you know that it is okay to knock. Here I was hesitant to take BB up to a door unless they had a pumpkin out or I'd seen bigger kids go up already. That being said Halloween is much bigger than it was when I first moved here. Hopefully next year though we can be back in Ohio! 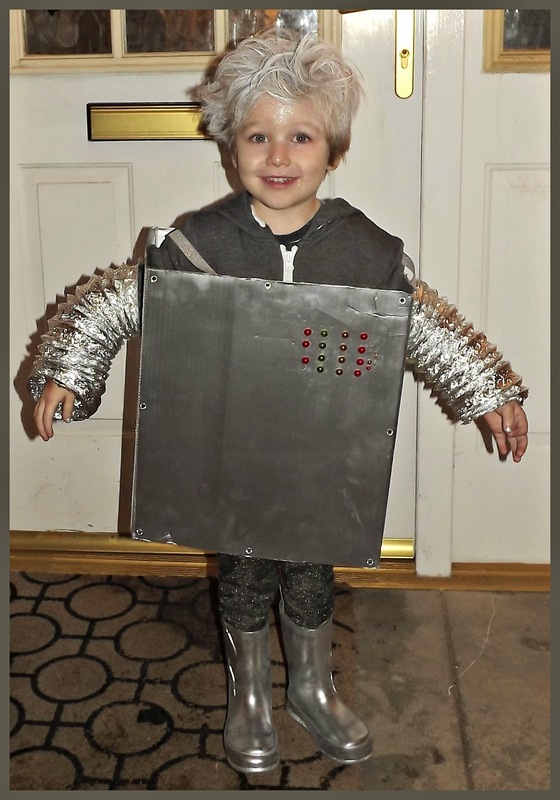 Cute Robot costume! Thanks for hosting this link up! His costume is EPIC! I'm so impressed (and kind of want to use that idea next year for myself :) And your makeup? For 10 minutes it's fabulous! I just love it! Happy (belated) Halloween!! Haha I love your halloween makeup! You did a great job! 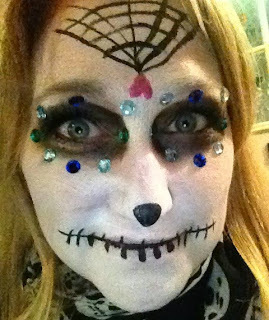 I LOVE the robot costume, and your sugar skull makeup looks awesome! I was on a plane to Cincinnati on Halloween, actually, so I didn't wear a full-on costume, but I did wear some leopard-print cat ears and a leopard-print sweatshirt. I love Halloween, and homemade costumes are definitely the best! Great costume for both of you!! I wished I had an ounce of imagination so I can make a costume for my son too. Oh wow you both look amazing! Great Halloween pics and thank you for inviting me another week. That is the cutest robot outfit! What a cutie! That costume is so adorable. Great outfit! Love your make-up, amazing for 10mins! Popping by your fun linkup .....those Halloween costumes are sooooo cool!!! so cute! love the costumes. thanks for hosting! I never dress up for Halloween and this is the first year I wish I had. Love the face paint---I'm definitely feeling inspired for next year! Robot and sugar skull hit it out of the park! I think his costume turned out great! And that's an impressive make-up job for only having 10 minutes. You out did yourself with this costume. Thank you! Aww I bet he was a super cute owl! What were you doing in Cincinnati? We stayed at my husband's mom's house in Ft. Thomas for a night before heading down to Danville for his homecoming at Centre. So cute! This year I made myself a Bambi costume.